Generate cheap, green electricity from sunlight. PV cells don't need direct sunlight to work - you can still generate some electricity on a cloudy day. PV cells are panels you can attach to your roof or walls. Each cell is made from one or two layers of semiconducting material, usually silicon. When light shines on the cell it creates an electric field across the layers. The stronger the sunshine, the more electricity is produced. PV cells come in a variety of shapes and colours, from grey "solar tiles" that look like roof tiles to panels and transparent cells that you can use on conservatories and glass. The strength of a PV cell is measured in kilowatt peak (kWp). That's the amount of energy the cell generates in full sunlight. Do you have a sunny place to put it? You'll need a roof or wall that faces within 90 degrees of south, and isn't overshadowed by trees or buildings. If the surface is in shadow for parts of the day, your system will generate less energy. Is your roof strong enough? Solar panels are not light and the roof must be strong enough to take their weight, especially if the panel is placed on top of existing tiles. Cut your carbon footprint: solar electricity is green, renewable energy and doesn't release any harmful carbon dioxide (CO2) or other pollutants. Cut your electricity bills: sunlight is free, so once you've paid for the initial installation your electricity costs will be greatly reduced. 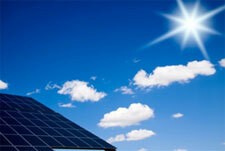 A typical home PV system can produce around 50% of the electricity a household uses in a year.